TORONTO (May 5, 2014) – The National Hockey League Players’ Association (NHLPA) announced today that centre Sidney Crosby of the Pittsburgh Penguins, centre Ryan Getzlaf of the Anaheim Ducks and centre Claude Giroux of the Philadelphia Flyers have been nominated as finalists for the 2013-14 Ted Lindsay Award. The Ted Lindsay Award is presented annually to the “Most Outstanding Player” in the NHL, as voted by fellow members of the NHLPA. Crosby – last season’s recipient – is seeking to be named the “Most Outstanding Player” by his peers for the third time in his career, while Getzlaf and Giroux are each looking to receive their first Ted Lindsay Award. The 2013-14 Ted Lindsay Award recipient will be announced on June 24th during the 2014 NHL Awards from Encore Theater at Wynn Las Vegas. Sidney Crosby, of Cole Harbour, Nova Scotia, Canada, played 80 games for the Pittsburgh Penguins during the 2013-14 regular season, and helped lead the Penguins to the second-best record in the Eastern Conference. He won his second Art Ross Trophy for leading the league in points (104), while he finished first in assists (68), third in faceoffs won (991), first in points per game (1.30), first in even strength points (66) and led all forwards in average ice time per game (21:58). This marks seven out of the last eight seasons that a Penguins player has been nominated for the Ted Lindsay Award. Crosby is vying for his second consecutive and third career “Most Outstanding Player” award (2006-07, 2012-13). He was a finalist in 2009-10. Ryan Getzlaf, of Regina, Saskatchewan, Canada, played 77 games for the Anaheim Ducks during the 2013-14 regular season, and helped lead the Ducks to the best record in the Western Conference. He finished second in the league in points (87), scoring a career-high 31 goals, and placed third in points per game (1.13) and fifth in assists (56). He also finished the season with a +28 rating, the second-best plus-minus of his career. He is the second Ducks player in the last four seasons to be nominated for the Ted Lindsay Award, after teammate Corey Perry was a finalist in 2010-11. As a first-time nominee, Getzlaf is looking to become the first Ducks player to receive the “Most Outstanding Player” award. Claude Giroux, of Hearst, Ontario, Canada, played in all 82 regular season games for the Philadelphia Flyers in 2013-14. He placed third in the league in points (86), fourth in assists (58), second in power-play assists (30) and fourth in faceoffs won (931). For the fourth consecutive season, Giroux led all Flyers players in assists and points. His 28 goals equaled a career high, and he helped lead the Flyers to the club’s sixth playoff appearance in the last seven seasons, after a slow start to the season. Giroux is seeking to receive the Ted Lindsay Award as a first-time nominee, and he would become the first Flyers player to receive the Award since Eric Lindros in 1994-95. As part of today’s Ted Lindsay Award announcement, the NHLPA also launched the 2013-14 Ted Lindsay Award Contest. Fans are encouraged to select the player who they think will receive the Ted Lindsay Award this season, just like the players have done. A random draw will take place following the 2014 NHL Awards to determine the Grand Prize winner, as well as the second and third-place finishers. 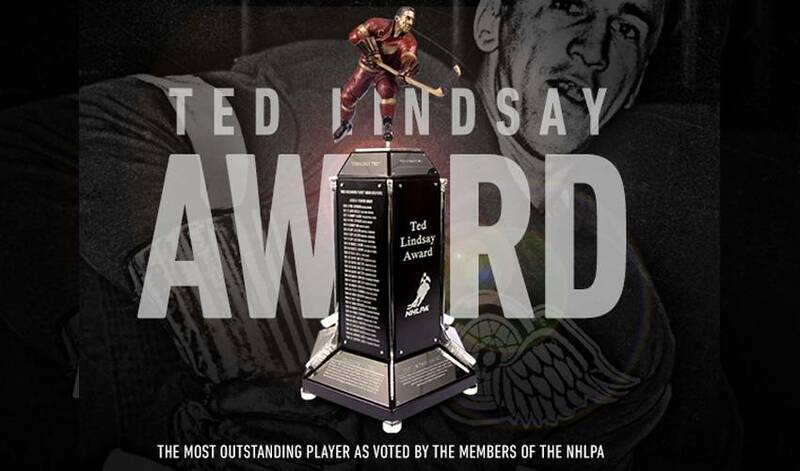 For more information on the Ted Lindsay Award Contest, including the rules and regulations, please visit http://www.nhlpa.com/the-players/ted-lindsay-award.